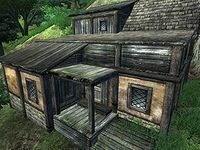 The Border Watch Inn is located in the settlement of Border Watch, just east of the Elsweyr border. The publican, S'thasa, has 50 gold and a leveled Mercantile skill. She rents rooms for 10 gold per night. She will also buy potions and food while selling only the latter. Her wares also include a high-quality blunt weapon (the best at your level and usually enchanted), which you can only buy after having reached 50 Mercantile. Since it is not a merchant item, it respawns every time you level up. The ground floor contains the reception area, consisting of a large counter and bar and the rooms. On the right is the Inn's famous cheese museum, which contains various varieties of cheese not found anywhere else, while on the left is a dining room. Behind the counter is a Nirnroot plant. The room you can rent is 'number 1', the one closest to the entrance. It is spacious and contains two chests of drawers and a lower-class double bed. Room 'number 2', which is locked, contains an owned double bed and an upturned table. Esta página foi modificada pela última vez à(s) 22h29min de 22 de julho de 2013.